Despite the lack of legislation to encourage corporate giving, social entrepreneurship is growing among Russian firms. Darya Alexeyeva, the director of a workshop for young adults with developmental disabilities, felt like celebrating when her students earned $6,000 at a recent craft fair. “It was an enormous sum compared with previous events,” Alexeyeva said. What made the results of this craft fair so different from previous ones was the combination of social networking and a profit-sharing arrangement that gave the students more of a vested interest in the outcome. "As we were gearing up for the fair we started promoting our products via social networks and selling them online. As a result, almost everything went by the time of the fair so we had to make new items urgently,” Alexeyeva said. Her students, however, were not particularly motivated to put in the extra effort needed to create more bird feeders, magnets and other small craft items. 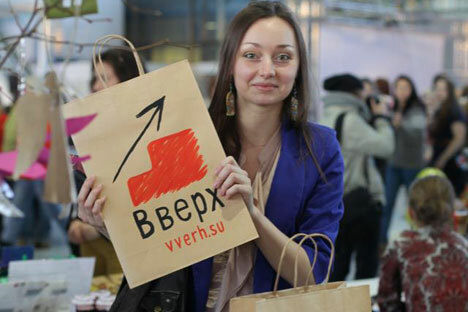 Then Alexeyeva and her colleagues decided to give the students part of the profit from the sale of their creations. For every item sold, the profit remaining after deducting the cost of materials was split evenly between the student who made the item and the organization, Step Up (Vverkh). The decision to give the money back to the students meant that the organization could not cite the program in any applications for grant money, but Alexeyeva believes the decision resulted in a far more valuable outcome. "We could have launched a series of master classes in occupational therapy instead and claim a grant for this, but we chose to run practical workshops for the children and turn their work into real money. It's not even about the things we build or the money we make but rather about our students getting involved in something tangible and constructive, being able to earn their own money, and working in groups. Never before have they had such an experience." Although the economics lesson may not help Step Up win any grant money, it may help attract attention from businesses looking at expanding their charitable initiatives. Step Up, which has operated in Moscow for about a decade, has benefited from financial support from Merrill Lynch, PricewaterhouseCoopers, Linklaters, Globus and Ernst&Young and the hope is that Russian companies may soon join this list. Corporate charity is fairly common among Western firms, and many governments, including those in the U.S. and the UK, have legislation in place to make charitable giving an attractive business practice. Data from the Russian Agency for Strategic Initiatives shows that the value of social services provided by Russian business, which range from donating money to non-profits to making jobs available to those with developmental disabilities, could reach $450 billion by 2020. Soroko said, “Further development of social entrepreneurship is being hampered by the relatively slow pace of structural reforms, but there is hope that the process will be sped up in the next few years." Some are not waiting for the government to improve the conditions for corporate charity. Uralsib Bank has partnered with Opora Rossii, an advocacy group for small- and medium-sized businesses, and the Our Future Fund to provide assistance to businesses interested in engaging in corporate charity. Opora and Our Future are lobbying for changes to the legislation and providing free consultations to businesses interested in the financial and legal aspects of social entrepreneurship while Uralsib has started a program to give loans with lower interest rates to companies involved in charity. Our Future is already leading by example example. The foundation, created in 2007 by Vagit Alekperov, C.E.O. of Russian oil major Lukoil, has so far provided approximately $6 million in financial support to around 100 different social projects.